Carry On in Faith follows the events leading up to Jesus' resurrection on Easter, beginning from Palm Sunday. 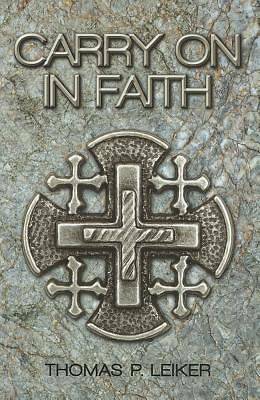 The author takes a contemplative approach, reflecting on the deeper meanings of Jesus' life. "The last days His family, disciples, and friends were able to spend with Jesus unfolded into a new way of life, and became their first days with Jesus in faith," he writes. Included throughout are reflection/meditation questions that drive the reader towards contemplation. Through these reflection points, the reader will gain insight on the events that led to Jesus' death and resurrection and their connection to his/her life of faith today. Author, Thomas Leiker encourages us to consider how we experience Jesus in our lives with the impact of our 'real world' superstructure, culture and tradition. In walking Jesus' last human days with Him, we are meant to step into the light of a new life and a beginning with Him, as His last days become our first.